As an Employer you can take specific actions on each JobCast you post. After a JobCast has been set live you can use the JobCast Actions menu to modify it at any time. Updates Center - Answer questions from the community, send announcements to all of the recruiters working on your role, or adjust the JobCast's Candidate Flow to Yielded if you want to slow submissions and ensure recruiters are prioritizing their efforts properly. Edit - Allows you to change a live JobCast description, Must-Haves, Nice-To-Haves, Screening Questions, or transfer the JobCast's Ownership to another member of your Organization. Share Candidates - Is a tool to share candidate profiles with hiring managers. 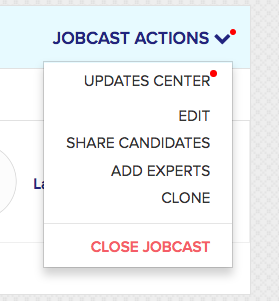 Add Experts - Is a feature that lets you add additional Agencies to a JobCast after it has been set live. Clone - Creates a carbon copy of a JobCast in the event a duplicate role in a different location is opened for submission. Close JobCast - Should be used when a JobCast should no longer be recruited for.